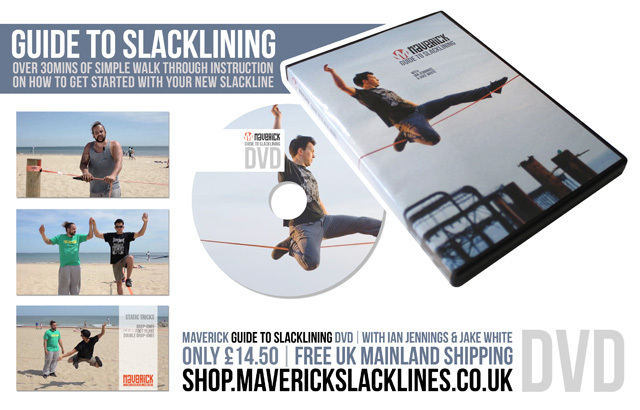 Maverick PRO-SYSTEM from Maverick Slacklines on Vimeo. Here’s some tips on how to set your line up and get slacklining. Been out on the SlackLiner and its Top Of The Popps, Love It ! Why does the anchor point circumference have to be 1m? So great to hear your loving your slackline! the anchor points just need to be strong enough to handle the job…. trees with 1m circumference are going to be able to take a slackline set up. But it really depends on what kind of tree / anchor you are using! Hi, i’ve never tried slacklining before but would love to give it a go. i have a swing set very similar to this http://www.outdoortoysdirect.co.uk/images/products/amca/Amca_Concept_Triple_Swing_Plusn.jpg but it has an extra pole at the ends going to the floor, it’s about 10m wide and quite sturdy. Would it be suitable to set up a slack line on? Also, is it legal to set up slacklines in public parks such as hyde park or regents park and is there any documentation i should carry to prove it? Tree protection needed but stickers left on the tree is okay? haa I like it. Looks fun, quite fancy getting into it to do some high-lining. What material did you use as tree protection in the video? website regularly, if so then you will absolutely obtain fastidious know-how. Hi there, we have a great maverick pro system in the garden. Is it ok to leave it set-up for the summer, or should we be taking it down each day? Thanks, Matty.